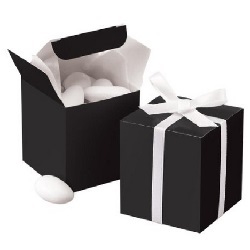 Black and white wedding favors are classic favorites that are making a comeback. You don’t have to come up with something trendy in order to plan an unforgettable wedding. Sometimes, the best things in life are tried and true. If you want to plan a wedding that is tried, true and elegant, you may consider selecting black and white as your color scheme. This is an easy scheme to work with in terms of decorations, and the end result is a sleek, modern wedding with romance and sophistication flowing from the vows to the reception. This is a simple wedding color scheme in many ways. 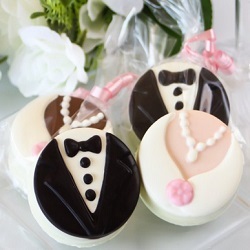 You can select a traditional white wedding gown and black tuxedos for men in the wedding party. Yet, there are some elements that you still need to plan carefully. For instance, you may want to include a pop or color when finalizing your ceremony and reception décor. Bright red pops against black and red and draws the eye, but many brides prefer the subtle approach of soft pink or baby blue accents. As you plan the décor and other fine details, think about what you will give your guests to show your appreciation. They take their time to attend your wedding, and they look forward to the favors. 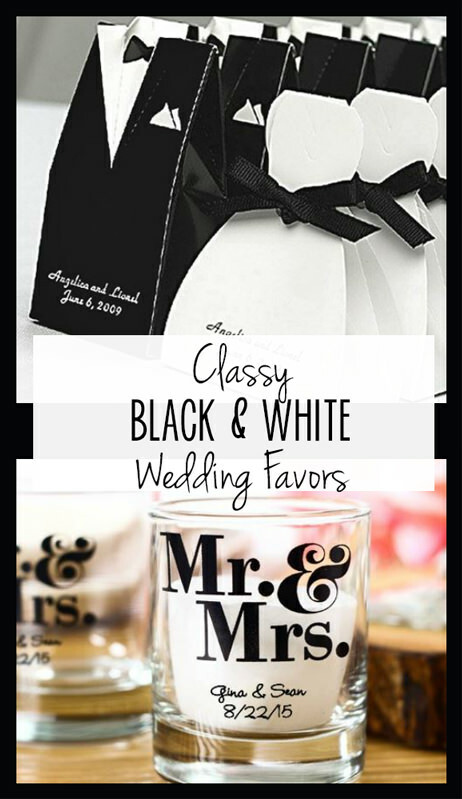 There are many favors that fit the black and white wedding theme beautifully, and the following options are suitable for any budget. 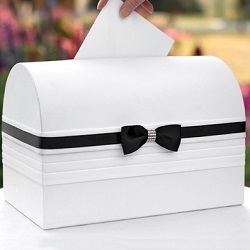 Personalized Tuxedo and Wedding Gown Favor Boxes - Fill these boxes with candy or other fun treats, and your guests will gladly take them home. 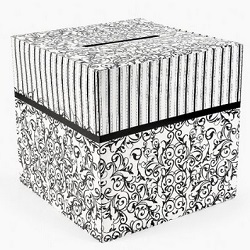 Each box features a tuxedo and wedding gown dual design and comes customized with information of your choosing. Candle Favor with Chalk - These unique wedding favors allow you to personalize your favors yourself. Your guests don’t have to keep your customized touch of art because they can simply erase it and write in a message of their own. 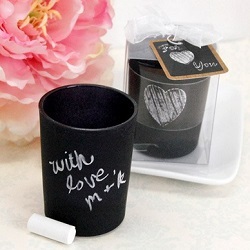 Each of these tea light holders comes with a chalkboard outer surface that is suitable for assigning seats to guests, leaving personal messages for special guests, or simply offering something fun for your guests as they head back to their daily lives. These favors will serve as keepsakes for your loved ones long after you say “I Do” and head off for your honeymoon. 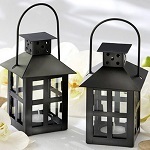 Mini-Lantern Tea Light Holders - These black lanterns look amazing sitting along a favors table or as place settings for each of your guests as they settle in for dinner. You can light them for the reception to help with your romantic vibe during dinner, or just leave them fresh for burning when your guests get them home. 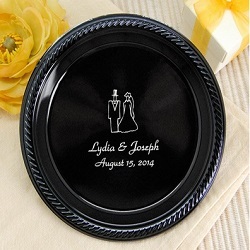 If you want black and white wedding favors that can double as decorative items, this is a great product to consider. 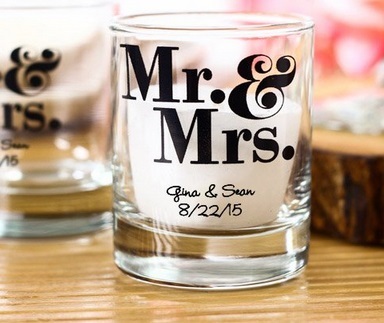 Personalized Shot Glass Votive Holders - This wedding favor idea serves double duty. You can use them as shot glasses and hand them out to your adult guests at the reception bar. You can also place candles inside each glass and set them out on your reception tables. 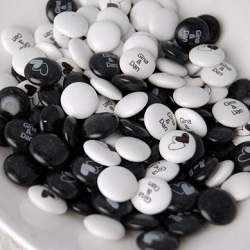 You may even want to fill them with black and white candies or another decorative feature and use them as part of your black and white wedding décor. Get creative, and you will find many ways to incorporate these customized glasses into your wedding day. 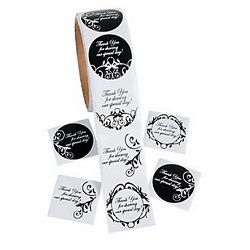 Wedding Roll Stickers - If you’re shopping on a tight budget, you will appreciate the low price point on these rolled black and white wedding stickers. 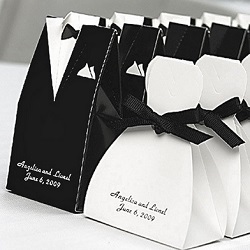 You can use them to fill favor boxes or organza pouches, or simply hand them out to children so that they are entertained during your reception.